RSS (most commonly translated as "Really Simple Syndication" but sometimes "Rich Site Summary") is a family of web feed formats used to publish frequently updated works—such as blog entries, news headlines, audio, and video—in a standardized format. An RSS document (which is called a "feed", "web feed", or "channel") includes full or summarized text, plus metadata such as publishing dates and authorship. Web feeds benefit publishers by letting them syndicate content automatically. They benefit readers who want to subscribe to timely updates from favored websites or to aggregate feeds from many sites into one place. W3C RSS 1.0 News Feed Creation How-To - W3C. All About RSS - faganfinder.com. Introduction to RSS - WebRef. RSS in Depth - Sam Ruby. RSS: Lightweight Web Syndication - Rael Dornfest. What is RSS? - Jennifer Kyrnin. Why Choose RSS? - Tony Hammond. This step-by-step guide offers bloggers, web developers, and programmers an understanding of content syndication and the technologies that make it possible. It highlights all the new features of RSS 2.0, and offers complete coverage of its rival technology, Atom. Confidently teaches you how to produce your own data feeds to syndicate news and blogs. Adding a CSS StyleSheet to your RSS Feed - Pete Freitag. An Introduction to RSS for Educational Designers - Stephen Downes. Building a Semantic Web Site: Bring Metadata Back to RSS - Eric van der Vlist. Creating and Maintaining a Campus RSS Channel - University of Texas at Austin. Don't Believe RSS Hype - Jim Rapoza. Fixing (RSS/Atom) Newsfeed Subscription - D. Keith Robinson. Get Off Your RSS! - Nathan Matias. Making a RSS feed - Danny Sullivan. Making RSS Pretty - S. Burke. Making Your RSS Feed Look Pretty in a Browser - Ben Hammersley. Putting RSS to Work: Immediate Action Feeds - Mark Woodman. RSS 2.0 Specification - Harvard Law. 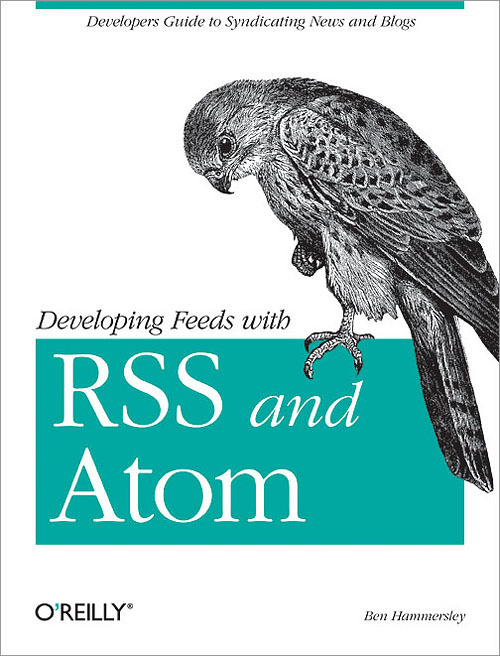 RSS 2.0 and Atom 1.0, Compared - Tim Bray, Paul Hoffman, Sam Ruby, and Rob Sayre. RSS 2.0 Specification Published - Berkman Center. RSS: A Quick Start Guide for Educators - Will Richardson. RSS and You - Chris Nandor. RSS Tutorial for Content Publishers and Webmasters - Mark Nottingham. Rich Site Summary (RSS) - Robin Cover. The Evolution of RSS - By Andrew King. The Rich Site Summary (RSS) DevCenter - O'Reilly. Transforming RSS into HTML and WAP. What is RSS? - Mark Pligrim. Why RSS Is Everywhere - Xeni Jardin.